Two weeks on from Australia and there are still many questions left unanswered on and off the track. On the track the picture still needs to become clear. Hamilton dominated the race weekend in Melbourne but Vettel ended up taking the chequered flag after a very fortuitous safety car pit stop. Vettel was outdriven by Hamilton and more surprisingly Raikkonen all weekend and has since admitted the car is not acting how he would like. The pace of the Ferrari is still impressive and Vettel believes there is huge potential if the grip issue is resolved. The battle will recommence under the lights in the desert but can the likes of Bottas, Raikkonen, Ricciardo and Verstappen join the fight at the top. 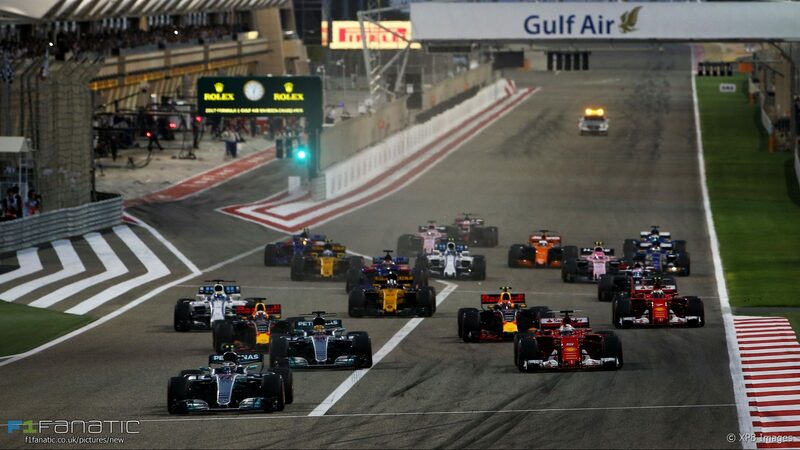 The Bahrain circuit offers more chances to overtake than Melbourne which should hopefully present more action on track instead of in the pit lane. With the weekend due to begin with fireworks away from the track hopefully Sunday’s action can take the headlines away from the political arguments happening backstage. Can Red Bull or even Haas challenge Mercedes and Ferrari? Daniel Ricciardo believed he had the fastest car in Melbourne as he caught Raikkonen and Hamilton at the end of the race. This is misleading as Hamilton turned down his engine after overheating the power unit trying to get past Vettel. Raikkonen may also have done the same as with only 3 engines available this season it is worth saving the engines when possible. I do believe Red Bull can have a major say in this race. Their qualifying pace is still behind Mercedes and Ferrari but their race pace brings them a lot closer to the big two. Both Ricciardo and Verstappen have the ability to jump a couple of places off the start and once their in the mix anything can happen. Red Bull might also have worry about the Haas as they shocked the grid in Melbourne. Both Haas drivers managed to get infront of Verstappen and were running 4th and 5th when pit stop errors meant both cars had to retire within a few laps of each other. It turns out cross threaded wheel nuts meant tyres weren’t connected properly when leaving the pits but it will be interesting to see how their pace holds up on a track where overtaking becomes a little easier. McLaren and Force India are two teams bringing big upgrades to the Bahrain Grand Prix. McLaren will be hoping Australia wasn’t a fluke and although it’s unlikely they will manage 5th again, another double points finish would be a very positive step. Alonso remains very confident about the teams direction and is still anticipating a podium this season but Bahrain will come to soon to get involved with any champagne. Force India would just like a point as both cars finished outside the top 10 at the first race of the season. The upgrades are supposed to be coming thick and fast and they will be eager to become competitive very soon. With McLaren, Renault and Haas all improving they face a fight to retain 4th in the constructors Championship. Can Honda show their testing form? Both Toro Rosso drivers faced issues at Albert Park most notably Gasly who suffered a much too common Honda engine failure. It looked as though the reliability issues had been resolved when completing lap after lap during the winter test but it has reared its ugly head on race day once again. Honda has now modified the turbo and MGU-H which were blamed for the failure and they will be replaced on both cars. This is an unwelcome change this early in the season as teams are only allowed three of each all year. Grid penalties are likely to follow later in the season but Honda will be hoping to reduce the numbers accumulated last year. If Toro Rosso can show what they did in testing without any issues there’s no reason why they can’t steal a point or two but with the teams around them improving fast, the power shortage of Honda might become a lot more noticeable.